Navigation skill is one of the most important skills in world of pirates. Your navigation skill decide how many and how big ships you can sail and how many specialists you can hire. Learn about specialists here. 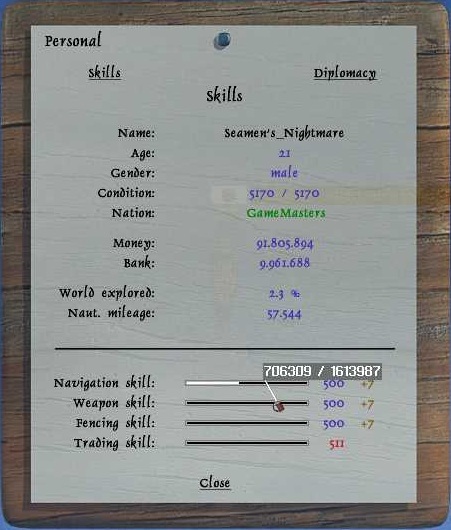 Navigation levels increases in how many points, you need to gain the next level, you can see how many points you need by using the right click menu and click personal. By holding the curser over the line it tells you how many points you have and how many are needed. You can also see your skill progress in the status bar by holding your curser over the S, if you selected in options, to have your skill progress showed as points, you will see the points you have and how many are needed. If not you will see a line, as you do in personal, just here you cannot hold curser over it, to see the points. At the beginning you can only sail one sloop, but as your navigation increases, you will be able to sail more or bigger ship, you will get a message in game, when you can sail the next ship class, this do not mean you have to. After you reach navigation 100 and it tells you, that you can sail War Galleon, the messages will stop. Here is a list of when you can sail the different ships. Learn more about ship classes here. You can use the fleet calculator to see how many of each ships you can sail. The bigger ship class you sail, the more navigation points you gain by sailing. For every 1000 naut. Miles you sail, you get a navigation bonus of 500 points. You can hire a specialist called mate, to help you get more navigation skill. At the beginning, the easiest way to gain more navigation, is to do a world tour. This means finding all the cities, for each city you find you get navigation bonus. The more cities you find the higher the bonus gets. When you find all cities of a nation you get an extra navigation bonus and when you have found all cities you will also get an extra navigation bonus for that. To help you to more easily find the cities, use the map here. 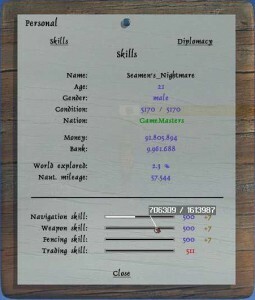 You can do % of map to gain more navigation, for each whole % you uncover, you get % x 500 navigation points. This means at 1 % you get 500 points, at 2% you get 1000 points, 3% you get 1500 points and so on. It’s a good idea to hire a specialist called lookout, if it is a good one, you will uncover the map quickly. You can do deliver jobs to gain more navigation, there are three deliver job types that is good for gaining navigation, deliver letter, deliver package and deliver person. To be able to do deliver well you need trade skill, trade skill four is optimal. Learn all about trade here. Deliver jobs are on time, as long you deliver them within the time limit you get a navigation bonus, the faster you deliver them the higher bonus you can get. Long distance deliver give more bonus then short. Doing several short distance deliver jobs, do not give you as much navigation bonus as long distance. Learn all about jobs here.